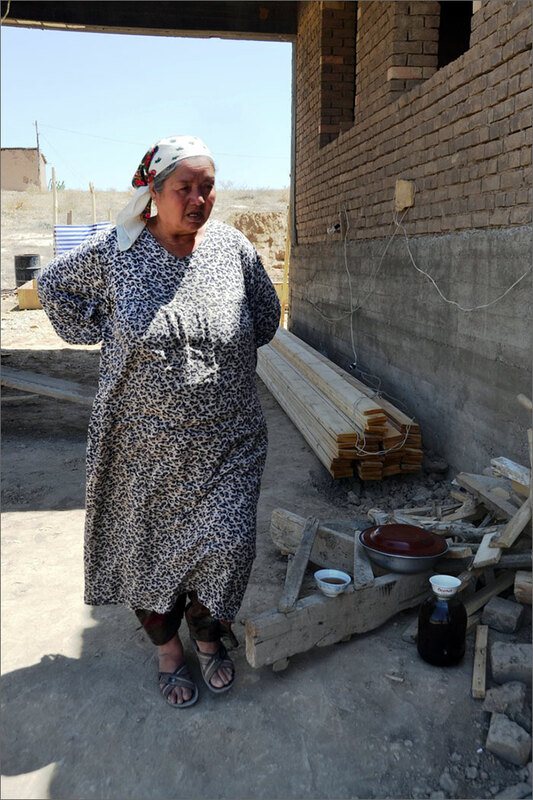 In April 2013, we wrote that ethnic Uzbek natives of Osh were forcibly moved from their homes to a suburban settlement of On Adyr (The Ten Hills). The houses that were preventing roads from expansion were destroyed and their owners were resettled. 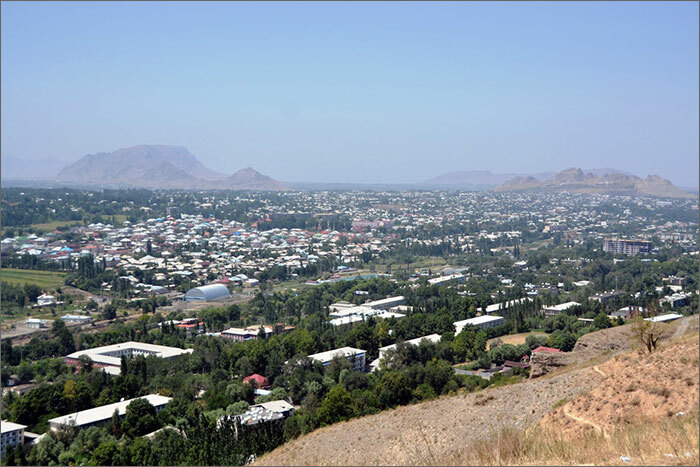 Fergana’s own correspondent Yekaterina Ivashchenko traveled to Osh again to see how their lives changed over the last several months. In order to reduce traffic on central streets, the Osh city hall launched the construction of new roads. Those roads, for some reason, had to be built on those areas where one-story houses are built, which are owned by ethnic Uzbeks (mahallas). Monuyev Street in Osh was one of such expanding roads, which resulted in the demolition of privately owned houses of Uzbeks. 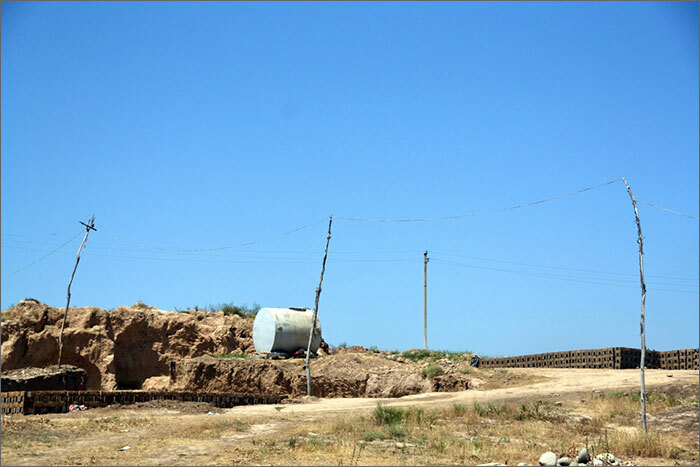 While the road construction is completed, half demolished houses are hastily covered with ad-hoc fences. I am again on my way to On Adyr. 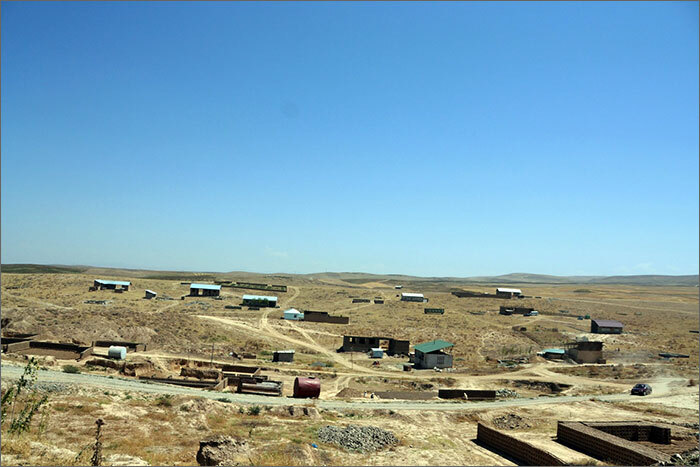 Once there, I am looking onto a rather saddening picture – bleak muddy and hilly location on the outskirts of On Adyr with no water pipelines, no electricity, ironically no roads here, not even trees. This place is exactly 10 km away from Osh. The closest marketplace is located in about a kilometer, the same distance to an elementary school whereas a middle school is three km away. The closest bus stop served by only two minibus lines is also a kilometer away. Occasional assigned lots are scattered across the hilly location. No single complete house yet: only unfinished constructions, temporary housings (habitable wagons) and foundations for future houses. 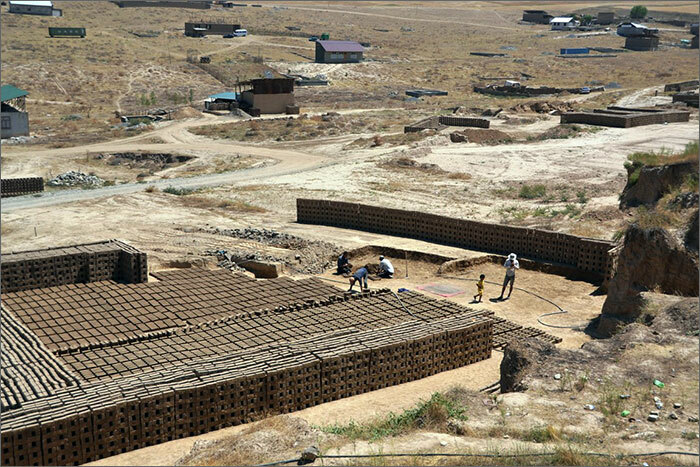 Because the land here has clay ideal for making sundried bricks, a couple of “brick factories” have sprung up. The chairman of the block, Hotam Mamatjanov, told me that he did not know the exact number of 28 lots assigned since March to those removed from Monuyev Street; one of them is certainly theirs. The problem of electricity supply was resolved thanks to local residents who allowed simply stretching an electricity cord from their private houses till the new construction site. Water is delivered either by water deliverers for money or the newcomers make arrangement with those who already live nearby. At night, the future neighborhood is quite depressing and miserable: an endless dark emptiness with occasional light bulbs here and there. I came back the next day during daytime to be able to talk to the new settlers. Mr. Kadyrov admitted that said area lacks utility services and people continue coming to his office asking to help with electricity and water supply. Mr. Kadyrov is certain that the most important factor in this matter is that the resettlement was fully compensated: “Everything was done voluntarily and everybody is happy. One has to understand that there are no other available areas within the city, except there. We made an offer to people and they agreed to it. The infrastructure will soon be there,” the official assured. Only the 5-person family of Kamil Nurmatov, among the other over 30 families resetlled to On Adyr, started constructing a house here. 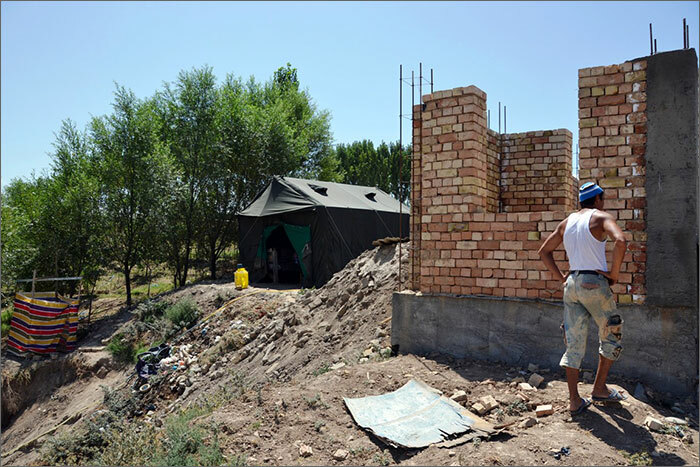 Kamil started constructing a house, because unlike his neighbors, he has nowhere else to go. He started building the house himself because the compensation he received was far less than the market value of the house he owned and was deprived of. 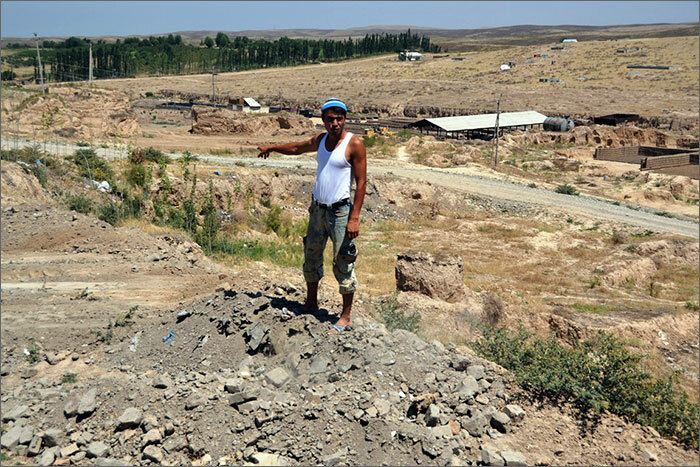 “Twenty-five families were given land lots here, but only I started constructing. Others have either moved in with their relatives or bought houses in other parts of the city,” Kamil told me. For his two-story house with eight rooms he has received 21,000 USD and .11 hectares of land for his own and his brother’s families. By the way, as Kamil says, an empty .05 hectares land here costs mere 2,000 USD. “I was offered 85,000 USD for my house three years ago. If I only knew what fate would befall me, I would have certainly sold the house,” Kamil laments. Kamil also said officials promised to install an electricity transformer till winter. Osh Mayor Melis Myrzakmatov is building a kindergarten nearby; they also promised a school would also be built in the neighborhood. “Of course we did not want to move. We had a school, a bazar, a park and a river near our house,” Kamil points around. 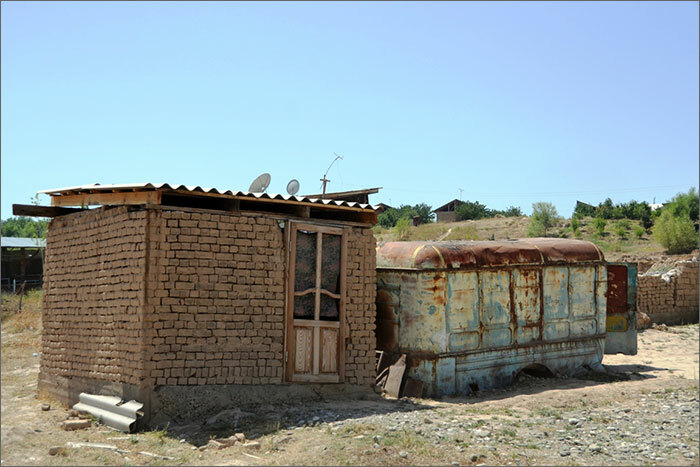 In order to be able to finish the house construction, Kamil used 7,000 USD, of the compensated 21,000 USD, to buy a vehicle for transporting construction materiel. 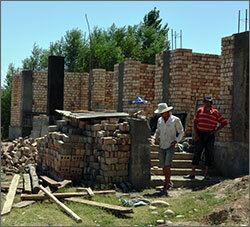 He has spent another 8,000 USD to build the foundation and erect walls. He contracted no constructors—he simply cannot afford. He rests here as well in a tent near the unfinished house. However, he spends nights in the city—he is renting an apartment from relatives for 100 USD a month, which is cheap price for Osh. Obviously, the remaining 6,000 USD will not be enough to complete the house and furnish it. So Kamil has another gap to fill—monetary one. It might first seem like Kamil’s future house is well located—it is the first house from the central road. But there is just one problem—a sinkhole just a step away from the foundation of his house. “My father picked the land lot from a map, which did not indicate the surface was uneven. So this is what I have now,” Kamil explained. 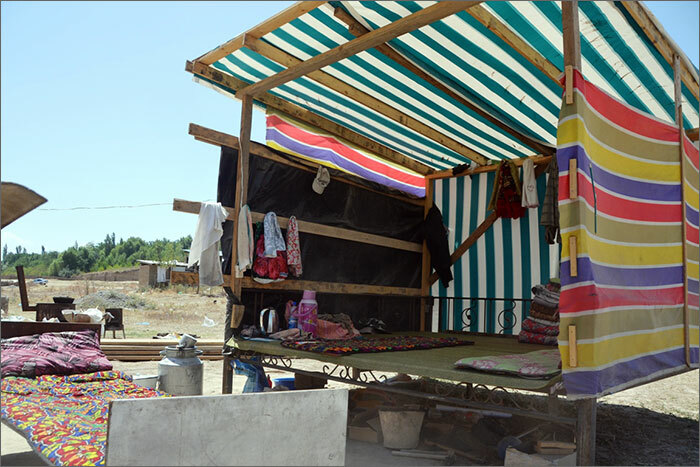 Fergana continues monitoring the situation around construction in Osh and the fates of the forcibly resettled Osh natives.